This is my first Woodriver plane and I am impressed. I needed a #7 jointer plane because I am building a woodworkers bench. I already have a Stanley Bailey #7 but really wanted a tool with a stiffer blade than the stanley. I tried the IBC in my Stanley and had some issues. Unfortunatly when Stanley built their planes back in the day they didn’t stick to specs very well. I needed a plane that is going to take use and be able to take replacment parts when the time comes. So I went shopping. I was looking at the Lie Nielsen #7 but my normal shoping place has them on back order. 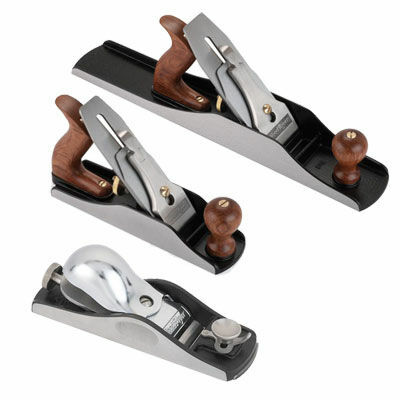 Veratis doesn’t offer a #7 jointer plane. Then I was told about the Woodriver #7. I watched the video on Rob Cosman’s web site and thought… Well….. I can always return it if I’m not happy. For those who don’t know Woodriver is sold by Woodcraft this plane is sold for $305. Also this #7 has only been available for a short time. I took it out and checked it for square with an engineers square. It was perfect all the way around. I looked at the blade and it appeared to be pretty sharp. So I figure lets take it for a spin straight out of the box. It cut the wood pretty good straight out of the box. I managed to get some of my bench flattened and thought I needed to share my experence with you guys. The handles are bubinga and beautiful, the base is as smooth as glass and the finish all the way around is equal to my LN planes. Overall I’m impressed and for the savings of approx $100 over a LN I guess I am pretty happy. The one and only reason I gave this item 4 stars instead of 5. It’s made in China. I really had to think about why I even considered 1 star less for an item made in China. I did some soul searching to figure out why I believed this item deserved less than 5 stars. Well, I think I have a fair answer for you guys. The reason is this: When the day comes to sell this plane, people will not pay the high resale price for something made outside the USA/Canada. Resale value is very important to me in everything I buy. If I bought a LN plane they resell on E-bay for as close to $20 retail price + Shipping. It’s an amazing thing to watch and it’s in part the reason I own many LN planes. In this case I don’t think I would be able to resell this tool for anything close to its retail price. I would take a bigger loss on it and I think people wouldn’t pay that high resale price… Because it is made in China. Nice review, I have to agree 4 out of 5 being it seems a little high for a China plane. I have some woord river tools so I’m not bashing.. All of us would love to have a shop full of Lie Nielsen,,, Congrats. Good Luck. Thanks for the review. They are nice planes regardless of thier origin. Wha?? Why not go directly to the Lie Nielsen website? Anyway, glad you’re happy with the WoodRiver though I’ve read more bad reviews about them than good…. I thiink if this hand plane were made in the usa or canada it would easily give LN a run for their money. I have had issues with items made in china with quality, this being my first wood river I am impressed.. I would have been willing to pay a near LN price if this supported employment in northern north america. When i bought the plane I didn’t consider it’s origin. I bought it based on a recommendation. It wasn’t till i started to review the plane i discovered its make location. BTW, the only place I could find that said where its made was the box. If some one needs a darn good #7 this is a great choice if they don’t care about where its made. It sounds a little like you care where it’s made. Would you have given it 4 out of 5 if you didn’t know where it was made? I appreciate your review. I don’t understand why you took away the star. You said you checked it was “perfect all the way around.” Are there other issues with the plane you don’t mention, or are you just knocking it because it is made in China? How about we just review the plane for what it is and what it does and forget about where it was made? After all, if a Chinese plane can be made to high specs at a lower cost, it might inspire American manufacturers to sharpen their pencil and give us great materials at a lower cost. It’s capitalism after all. Thanks again for the review. I hope you don’t think I am ranting, but I hear this alot and don’t think it has a place in tool reviews. I’m glad you’re happy with your purchase. But I would have consider the package deal for $70.00 more, I think it would have been a better deal. Granted it’s a #6 and not the #7 you purchased, but I think the set is money better spent. Truth be told, I’d love to have the #7 as well. I have a wr #5, and it is a nice plane. No complaints here…but I wonder if they are missing the “sweet spot” for themselves in the market at $305. Kind of spendy and approaching veritas and LN area. Not sure they can compete there. Thanks for the review. Wahoo, i have no need for those planes, I already have those sizes in Other brands. I was just going to link the same info as PurpLev, I have the BU Jack by Veritas and have a hard time faulting any aspect of it. With a .187 thk. blade, stiffness shouldn’t be a concern. The Veritas Jointer is on my personal short list. I always ONLY READ GOOD THING ABOUT WOOD RIVER PLANES. I DO OT UNDERSTAND WHY TO REMOVE ONE STAR BECAUSE THEY ARE MADE IN CHINA, DOES THAT REMOVE ANYTHING OF THEIR PERFORMANCES? A REVIEW IS ABOUT PERFORMANCE AND VALUE, NO? #7 jack plane in my opinion isn’t the same as a #7 bench, But never the less I thought Veritas ended at 6. Thanks for the Correction. The reason is this: When the day comes to sell this plane, people will not pay the high resale price for something made outside the USA. Resale value is very important to me in everything I buy. If I bought a LN plane they resell on E-bay for as close to $20 retail price + Shipping. It’s an amazing thing to watch and it’s in part the reason I own many LN planes. In this case I don’t think I would be able to resell this tool for anything close to its retail price. I would take a bigger loss on it and I think people wouldn’t pay that high resale price… Because it is made in China. These are my beliefs and this is how I wrote my review. All reviews have some personal bias. I am just honest about mine so people can decide for themselves if my bias is a reason they would or would not choose that item. KenBry, thank you for your explanation. I was in the local Woodcraft store last week looking at the IBC irons. Ended up buying the IBC Stanley 60 1/2 replacement with the $10 off promotional card. The salesman, nice guy actually, and pretty active in the local woodworking club, was showing me a set of Woodriver planes on display. I mentioned some of the reviews were less than 5 star. He said Woodriver took those comments to heart and made some significant changes the last couple of years. Since I don’t own one, I wouldn’t know, but he sounded pretty convincing. And probably would not have minded making another sale. I picked up the #4 and gave it a swipe. Real smooth and solid feeling. Well that’s my story.